Ross Jackson, chairman of the Danish-based foundation Gaia Trust and co-editor of Gaian Economics: Living Well Within Planetary Limits, provides a comprehensive and lucidly written history of neoliberal economics and its effects, tracing the inequalities inherent in neoliberal economic planning. Neoliberalism, as Jackson illustrates, isn’t an inevitable historical development, but rather an “artificial construct” created by people with a self-serving strategy that neglects the rest of humanity. 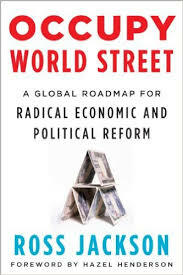 Jackson presents the fundamental flaws in modern economics, locates the turning point in regulation and economic behavior, and then shows how and why things have devolved to their current state through the actions of the IMF and WTO. He traces a new, emergent worldview, proposing a solution in the form of a Gaian economic system, in which smaller, decentralized, diverse communities with a degree of local democracy form the proposed utopia, in contrast to the branded neoliberal free market of corporate dreams.